GUI (Graphic User Interface). The windowing scheme such as X-Windows, Windows-95 or Mac OS (Operating System) that user interacts with using a mouse, keyboard and screen. I know the latest feature, always seems the most important, but clutter a menu of commonly used commands with it, unless it is commonly used. Don’t make it too easy to do something that might put the system into a state the user might not like, or that he might not know how to undo. For example, hitting Ctrl-G should not remap your keyboard to Greek. The things the user is most likely to do next should be possible with a single click. He should not have to chase down a multi-level menu tree bypassing options almost never used. Keep installation and configuring controls off to the side where they can be nearly always ignored/avoided. Any panel containing something the user is currently composing or reading should be instantly available with a single click on a single row of tabs. Dialog boxes shold not block you from doing thing to help resolve the problem: e.g. checking free disk space, consuliting online manual, looking up a customer record etc. Dialog boxes should not hide under ather windows in their own application. Open dialog boxes should not prevent you from minimising the app as a whole. If a button is disabled, hovering a the mouse cursor over it should tell you why. Works by analysing 82 examples of bad design. 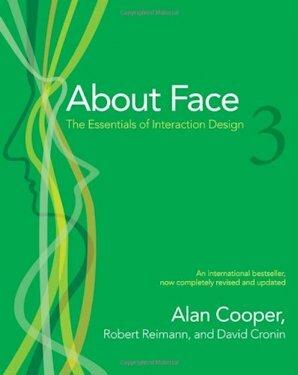 Raskin is one of the original designers of the Apple Macintosh and also a cognitive psychologist. 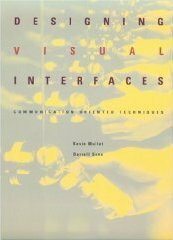 This is not a cookbook, but a book on basic principles focusing on elegance and simplicity; scale, contrast and proportion; organization and visual structure; module and program; image and representation; and style. I find it ironic that their book cover looks so bad in miniature. 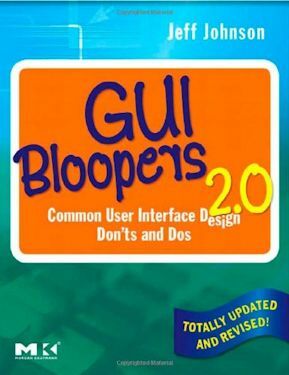 Though this is not particularly about designing GUIs, I love this book. 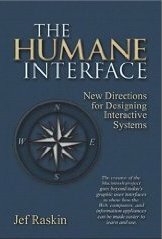 It was like meeting somebody else who understood my frustration with the ineptness in the design of user interfaces for computer programs, household appliances and just about anything mechanical. He grabbed ill-formed ideas out of my mind and laid them clearly on paper. A classic. The principles behind creating simple, useful, easy to understand appliances. Much of this thinking also applies to computer programs. This is a great read, highly entertaining. This book is sold under three alternate ISBNS: paperback:978-0-465-06710-7, 978-0-465-05065-9, 978-0-385-26774-8.